First of all some oranges, for an orange quilt sometime in my future. I keep adding a few. Years ago, on an quilt forum a lady whose first name was Judy did a quilt and named it Bushels of Orange(s)...it was all oranges with a bit of black and an accent of blue, on my computer it was sort of a torquoise blue. I totally loved that quilt and have planned to make one some day. I did not get this to go with anything specific...just in case I needed it for an alternate quilt block in the ones I am making now. Then I got some neutrals, since I have been using mine. One of these days I would like to make another two color quilt...such as the one below. Do you remember it? I made it in 2012...and it is kind of reversible...see? I didn't have enough of any single fabric so I did this using the same fabrics I had used on front. I think it was about 52 inches square. I love the orange and the bold reds! Gorgeous! ...Rose you do some beautiful work! Great purchases...LOVE orange. I've been buying a lot of neutrals lately also..trying to stay away from white-on-white, getting very light grays. Love them. I remember the log cabin quilt...lovely then and now. That quilt is a true work of art - so gorgeous and intricate. Glad you are enjoying some sewing time. I love the orange fabrics too. The red quilt you did is beautiful. You are so talented! Lovely colors! I look forward to seeing that orange quilt someday. I collect yarn the same way. When I see yarn I just love, I often buy it whether I have a current project for it or not. Sure enough, I have a room full of wonderful yarn. ;) I group it by colors and my projects are "born" as the ideas strike. I love both sides of the reversible quilt and I am a fan of polka dots, although not orange, but these are beautiful together and will make a wonderful quilt..
Of course I love the oranges. But those neutrals are beautiful. 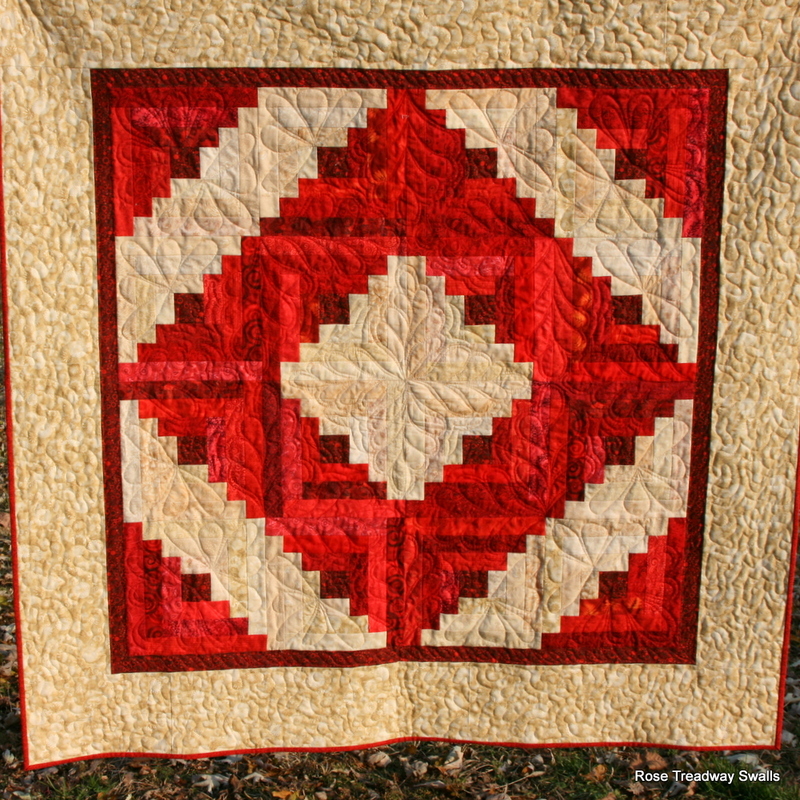 The quilting on the quilt you made in 2012 is gorgeous. Did you quilt it or have it done? What a gorgeous quilt, you are so talented! Gosh! That red quilt is a thing of beauty! You are so talented. 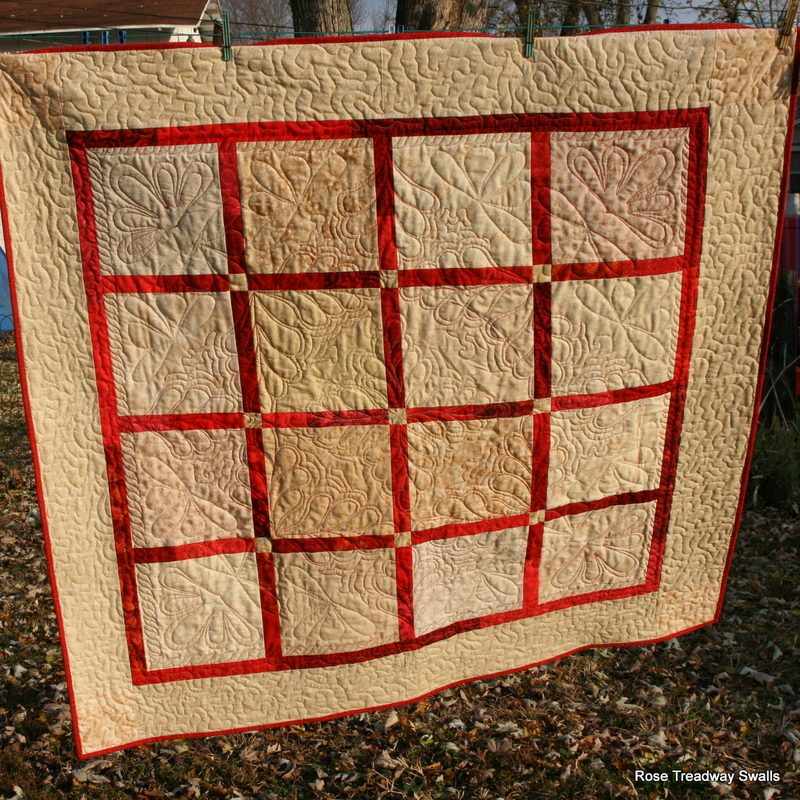 I love the idea of your orange quilt with blacks and blues for contrast. The oranges are beautiful. What a great way to use up left-over bits of fabric. I'm always on the lookout for things to do with my dress-making off-cuts, and you've just sent me off on a whole new line of inquiry. Thank you for the inspiration, Rose. Fabrics cheer me up too. I love sorting and folding and arranging fabric almost more than actually sewing. I love your reversible quilt! One can never have to much fabrics on hand!!! you are so talented at you fabric therapy my friend! You are an artist with the needle Rose. These are all gorgeous! I think orange and turquoise will be such a calming quilt! Your work continues to astound me. Beautiful in every way. You make the most gorgeous quilts. Love that last one ---both sides.